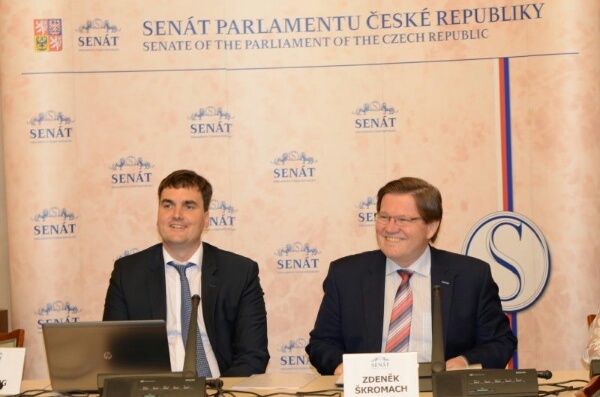 The first official meeting of the Czech-Slovak-Chinese Chamber took place on 14 of June 2016 under the auspices of senator and the deputy chairman of the Senate Ing. Zdeněk Škromach and advisor to the Czech president in the area of agriculture Doc. Ing. František Čuba, Csc. Charge d’affaires, his excellency Chen Jianjun from the Chinese embassy in Prague also attended the presentation. At the beautiful premises of the Czech Senate, president of the Czech-Slovak-Chinese Chamber Mr. Roman Spacil and the member of the Supervisory board Mr. Rudolf Zachoval presented to the public what are the current activities of the Chamber and future plans in terms of concrete areas of cooperation with the People’s Republic of China. The presentation was attended by more than 70 invited guests, including several members of the Parliament, senators and other figures of regional politics, as well as the representatives of renowned commercial companies from the Czech Republic and Slovakia. We deeply appreciate open proclamation of the support for our Chamber from senator and the deputy chairman of the Senate Ing. Zdeněk Škromach and the representative of the Chinese embassy in Prague charge d’affaires, his excellency Chen Jianjun.